The Glob_to_Loc function (see Converting from global to local coordinates (and vice versa) ) converts forces and deflections of a beam from the global coordinate system to the local system, defined by the longitudinal axis of the beam and a rotation angle from the horizontal plane. The rotation angle is required because a beam defined by its two end nodes has no defined rotation, but an alternative is to define the beam orientation with three nodes; i.e. the two end nodes and a third node lying on the local x-y plane. This approach is also used for plate-shell elements, where the plane of the element is defined by the coordinates of the corner nodes. 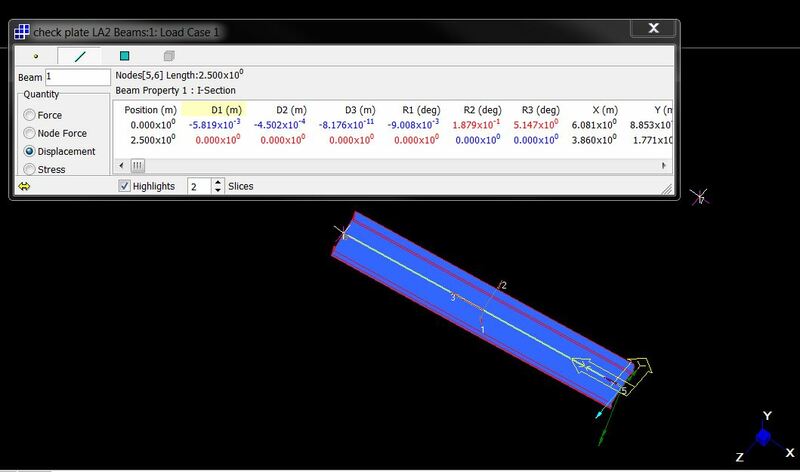 For a 3 Node beam element, using the Strand7 definition of the beam principal axes, use the Axtype = 3 option as shown below. In this case the beam orientation is defined by the 3 node coordinates, with an additional rotation of 30 degrees. 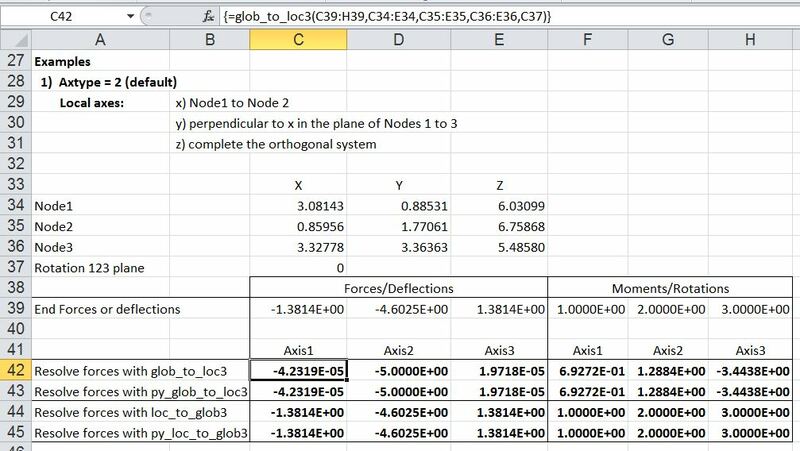 This entry was posted in Coordinate Geometry, Excel, Finite Element Analysis, Frame Analysis, Link to Python, Maths, Newton, Strand7, UDFs, VBA and tagged Excel, Glob_to_Loc3, IP2.xls, Loc_to_Glob3, Python, PyXLL, UDF, VBA. Bookmark the permalink. 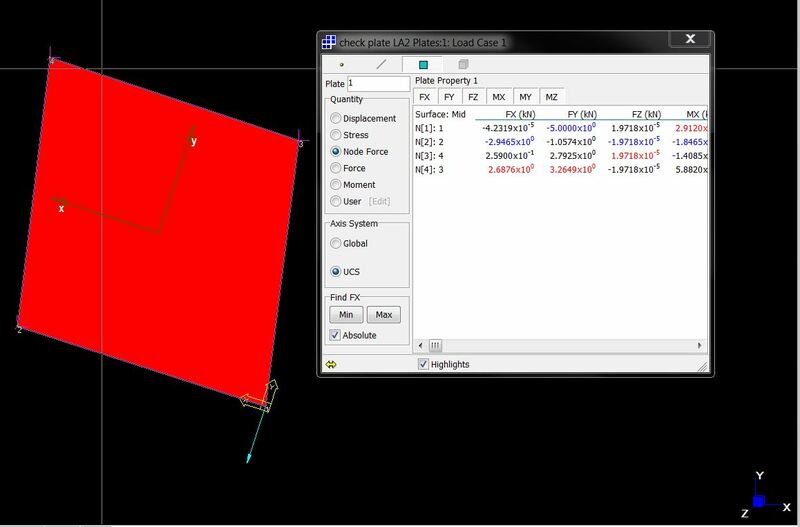 I am having a plate model with irregular quadrilateral plates which was created using STAAD Pro V8i software, from which I can got Mx & My (for both Local & global moment). But in that STAAD program there is no possibilities to get global Out-of-plane shear, the program is giving only local Out-of-plane shear. 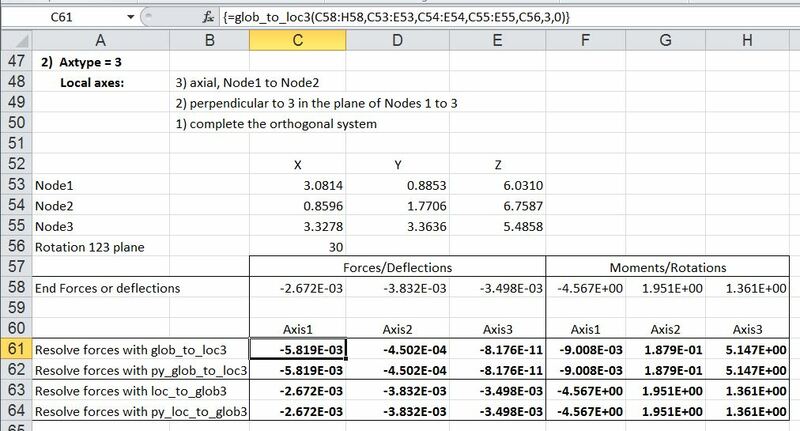 So I tried to use this excel to convert Local to Global Shear force. 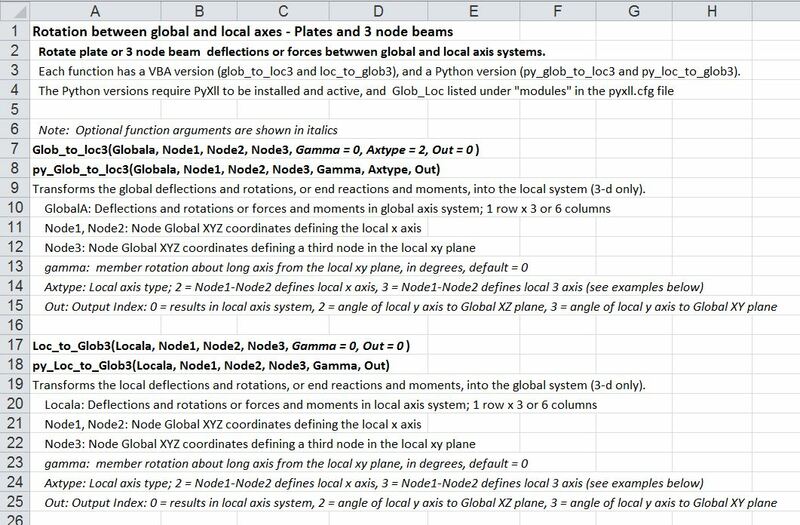 Initially I tried to verify the comparision of Global Vs local Bending moment arrived from the STAAD Pro program with this excel sheet. But it is not matching! In the excel sheet, while input the Bending moment we need to give local direction MX, MY, MXY (or) MX, MY, MZ. But in my STAAD program there is not MZ result output. How to overcome this issue.